Brand and consumer interaction through a Text to Win promotion. 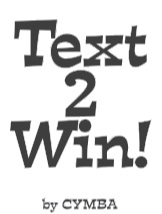 Text to Win competitions are typically used by brands for consumer interaction and product promotion. A text to win competition is often found on a pack of something, a bottle or can of drink. The consumer is encouraged to participate by sending a text message to a short code number to enter the promotion. Mobile messaging agency; Cymba work directly with big name brands or partner agencies to deliver a promotion. We have managed hundreds of successful text to win competitions brands such as Coca-Cola, Eurostar, Heinz and Colgate as well as on pack promotions for Newcastle Brown Ale, Carlsberg, Magners and Tyskie. We look forward to providing your brand with the most effective Text to Win service available.